It is probably quite rare to find a movie adaptation that is exactly the same like the book; but indeed this movie is one of them! I guess it's probably because the book itself is pretty simple and short - without too much conflict to cover. And so from beginning to end, there's nothing left behind. The movie adaptation is like the copy of the book (with some additional sweet moments, just to make you cry harder). I suppose it's a good thing, but unfortunately all the emotional moments doesn't really get me because I've known them beforehand. 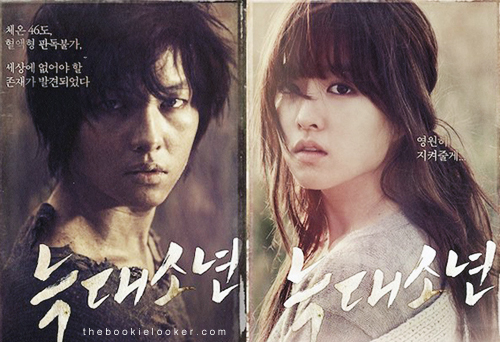 Another good thing, the werewolf boy is really charming, and the girl is so pretty ^^. 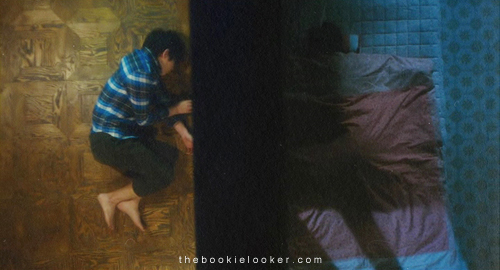 So here's my non-spoiling review for the movie adaptation of A Werewolf Boy by Kim Mi Ri. *there will be plenty of screencaps, so please be patient if it took longer to load. The movie starts off introducing the main character Kim Sooni as an old lady, and she's going back to her childhood village with her grand-daughter Eun Joo (played by Park Bo-Young who's going to be Kim Sooni when she's young). And then the story goes back to 47 years earlier; when the Professor who's experimenting with wolves died because of heart attack and when young Sooni moved in to the house. 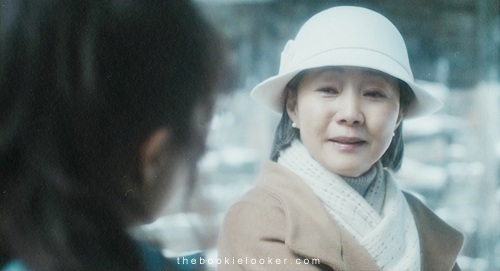 I really like the woman who played as Sooni's Mother (I've seen her before in the movie Hello Ghost, where she played mother as well). But in the beginning, Sooni's character is pretty rude. And at night, she writes in her notebook how she hates her life so much and just wanted to die. (This part didn't happen in the book, but it really gives more depth into her character). Well, the story only starts when Sooni saw a 'monster' in the outhouse, and that 'monster' is in the yard the next morning - only for them to found it it's not a monster, but a boy (handsome one, ㅋㅋㅋㅋ) played by Song Joong Ki. The boy cannot speak, and doesn't have any identity to explain who he is. So, Sooni's mother decided to keep them in the house and named him Cheol-Soo. But they are not aware of Cheol Soo's ability to turn into a werewolf boy. First of all, I have to say this movie is so beautiful - with the scenery and all (including the main casts). The first-half of the movie is all happy, fun, and full of cuteness while Sooni trains Cheol-Soo like a dog learning to behave. But I always make a bad face every time Ji-Tae appears on screen, because he's just so hateful. If you've read my book review, Ji-Tae is the only bad character in the book which causes the conflict. He wanted Sooni as his girlfriend but she always resist; and the appearance of Cheol-Soo only made him madder because Cheol-Soo always beats him up. And I have to say, the relation between Cheol-Soo and Sooni is super sweet; which will make people definitely cry at the end (I'll stop at that, no spoiler). 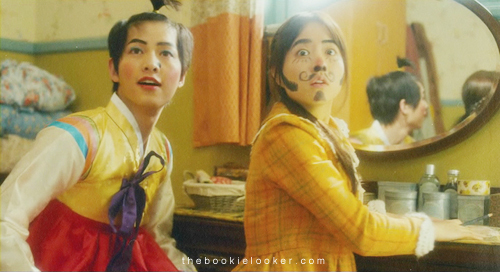 Another great thing about the movie is that both Song Joong-ki and Park Bo-Young are great actors. Song Joong-ki barely has any dialogue in the movie, and I think it's even harder to express feelings or emotion that way. But I think he did a wonderful job trying to be a werewolf (especially when he eat things without mercy like a dog). He literally delivers the character's emotion through his eyes and body gestures. I absolutely adore this guy's acting (and his face, of course). Park Bo-Young also did an excellent job - especially at the ending, her expression made me teared up. I've seen her in several other movies, and I admit she's wonderful (and pretty too, again). ** to close this review, I'm adding Song Joong-Ki's pretty face instead of his werewolf-face. I can never hate this guy, even though he's a 'jerk' in Nice Guy (his drama), or a werewolf like in this movie ♥♥♥ ㅋㅋㅋㅋ sorry for fangirling. After watched the movie I really want to pat Song Joong Ki's head as well. But even some scene is kinda heart wrenching, I didn't cry much. Maybe because I'm too full of sweetness and happiness from the first part of the movie. filmnya emang baguuss, tapi aku belum baca bukunya-_- ehehehe.